Canon—Too early to tell, as we still don't have their initial system. But my guess would be that we're going to see them go a bit hybrid with their mirrorless/APS DSLR lines. Over time they'll start to see these as the "same thing." Thus, you'll get more EOS M models working their way up a cannibalization of the Rebels. The key elements here are autofocus performance and M lenses, because everything else is there. I actually thought that the M felt a bit more upscale build-wise than the low Rebels, which is another plus for Canon moving forward. The elephant is moving, people. Pay attention. Fujifilm—"Yippee, we found a niche!" Expect Fujifilm to continue with that trend with more models and lenses focused right around the X-E1 mark. The full frame rumors are deceptive. I think Fujifilm is interested in that because it gives them a possible upward extension, but the whole mix up on whether the mount and lenses would work for that indicates that they haven't gotten very far on figuring things out. The current announcements have them quite busy through the coming year, and should sustain them as they work out the details of how they move up and down scale from the X-E1/X-Pro1 combo. But I don't expect them to stray far from the legacy approach or current models for the foreseeable future. What you see now is what you'll get, only more of. Leica—Dare they rest? No. Remember, they're at the high end of the mirrorless world in terms of pricing, so they can run out of customers quickly if they can't figure out ways to keep pushing the bar. I predict an autofocus M at Photokina 2014. Nikon—Boy did they miss a turn. 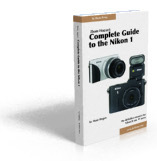 While they claim to be happy with the J1 sales and all the Stepford Men at the company are claiming everything's just right with the Nikon 1, Nikon has essentially created a compact camera with changeable lenses. With the m4/3 and APS sensor cameras outperforming them in all but focus speed and likely to continue to do so, Nikon can either fight back by trying to keep the traditional DSLR alive, or succumbing. I'll bet they succumb. We'll see a move remarkably similar to the Canon EOS M from Nikon within a year is my bet, and certainly earlier than Photokina 2014. They have no choice. They'll lose the "tweener" wars if they don't, because they've neglected DX DSLRs and thus would have a big gap in which they're vulnerable that extends from the J1 to the D600. That's the heart of the market! That's the most profitable part of the market. That's the user traditionally Nikon has gobbled up from others. Nikon might not see it in their survey data yet, but I see it in mine: the DX DSLR users are making choices right now. That choice basically boils down to "buy an OM-D or buy a D600?" More are picking the OM-D than Nikon thinks. It's actually the closest thing to the FM2n experience in digital than anything else. Does CX (Nikon 1) continue? Yes. It'll remain targeted low. It's actually an eventual Coolpix savior. But Nikon will have a DX M to deal with their problem in the middle of the market. Olympus—Good on them so far. They need to execute faster, though. Olympus actually has a few problems at the moment, and I predict they'll tackle them all soon. The Panasonic Power zoom kit is just so much more convenient than the Olympus solution, they have to match it at some point. Especially with the E-PM2 and E-PL5 getting the better 16mp sensor. But they need more than a basic kit lens here. They need a better super zoom solution than the 14-150mm. It's too big and unwieldy for the small bodies where users would demand it. It, too, needs to be a power collapsible lens. The real question mark though is which way to go from the OM-D E-M5? Up, down, or both? Panasonic is noising about the area above, and Olympus needs to be careful not to build too big an OM-D, or else it just gives DSLRs longer legs. I'll bet we'll see the downward thrust from the E-M5 before the upward one. It just makes more sense to where they are. Panasonic—Well, they told us what they're interested in doing: move more pro. Panasonic is also distracted by the video market implications. The AG-AF100 is now essentially dead in the water with Sony's onslaught of NEX video cameras. Panasonic has to respond. That alone means a lot of attention upscale on the video side, and they were already headed there with the GH3. Note also the lenses that Panasonic has been doing lately: all high end. Are these appropriate lenses for a GF6? Nope. I suspect that we're going to see less iteration in the GF and other low-end cameras and more in the G, GH, and maybe GX lines. I also suspect we'll see another higher end line. The noise about a full frame Panasonic? Trial balloon. I don't expect to actually see anything happen with that (though perhaps we'll see a larger sensor video camera—Sony is eating Panasonic alive on Super35 sized cameras). Pentax—still executing the 1990 game plan. Still not winning. Change of ownership didn't change the game plan. They need new coaches. Pentax is already executing the EOS M strategy, just not very well and with an odd choice (designer camera). They'll try to go more mainstream with this, right into the upcoming Canon/Nikon fight. Do not enter an elephant fight unless you're an elephant. Pentax isn't an elephant. Their better choice was to use the GXR as the platform for moving forward. They didn't do that (although that doesn't mean we won't get more GXR lensor modules: there's another one working its way through the system). Short version: don't expect a lot out of Pentax. Samsung—Here's another company that decided to go ahead and leak its choice: they're going Android. They'll start with the low-end of the NX line, but they'll move upwards fast if this gives them any traction they didn't have before. They made a great set of cameras and no one bought them. They're fishing for customers now. Of course, their lack of marketing and sales on the Samsung NX line is really what hurt them. Adding Android to the NX1000 doesn't make for a better low-end mirrorless camera, I think. It makes for a really expensive Galaxy model that requires an even bigger pocket. Expect more random wandering with the NX products, which is a shame, as they are darned good cameras as is. Sony—It's working (though more slowly than Sony wants), so expect more of the same.